After an amazing half season, Once Upon A Time wraps up its 3rd season with possibly one of the strongest conclusions yet. In many way this season finale could have been taken as a series finale, closing all storylines that had been introduced since Season 1 – that is if you ignore the last 5 minutes. So what happened, where will they go and why did these two episodes seem so familiar? These questions and more will be answered in this weeks ‘Looking Ahead’ – and the final one for Season 3. Note: For the sake of story purposes – and airing preference – , the episodes ‘Snow Drifts’ and ‘There’s No Place Like Home’ will both be discussed in this article. So let me get this straight: After ending up in the past, Emma messes up her parents meeting – which involved a tree and a carriage – and has no choice but to reunite them at a Ball when she notices their future is being erased from the story book. Despite many twists and turns, history is set right, Emma gets to see the moment her parents fall in love and – thanks to the help of one eccentric and intelligent individual – gets back to her time. WHY does this sound so familiar? Oh yah, that’s right. This episode was basically the entire plot of Back To The Future (1985). Not a small reference here or there, but it was more like we were being beaten over the head with it. Now sure there were some differences – one parent being betrothed, two people traveling rather than one, etc – but the similarities went beyond a slight ‘Who do I look like? Marty McFly?” joke. For the love of God, Rumplestiltskin aka The dark One was Doc Brown – or should I say ‘The Doc One’. All these overwhelming plot parallels aside, this was actually a great route for the show to take in these final two episodes. This whole season Emma was struggling with where she belonged. From admitting she was a lost girl in the first half to desperately trying to return to the fake life in New York during the second half, Emma loneliness was overwhelming at some points. Emma never had a connection to her Enchanted Forest past/parents. She was always an outsider who just came in to find her he was the end result of a fairytale love story that happened a long time ago. By going back in time Emma not only saw her parents love story, but also became a part of their love story by getting them together. The episode title “There’s No Place Like Home” is pretty self-explanatory, but what about “Snow Drifts”. There’s no snow to speak of; however, my theory is that this title actually means Snow – as in Snow White. Instead of “a deposit of snow sculpted by wind into a mound”, we see how the history of Snow White has ‘drifted’ from its natural course thanks to an unseen force and how change after change begins to ‘pile up’. First Emma and Hook must make sure her parents meet another way since they messed up the initial meeting. After setting things back on track and setting the meet at the ball, they don’t account for The Evil Queen to show up. This leads to Snow dropping the ring and Emma getting captured. Once these problems are fixed by going to Regina’s castle, Snow ends up using the dark fairy dust before its original use at the Troll Bridge. Every time Emma and Hook try to fix things, a new unseen problem arises from something happening out of order. Thankfully, Snow is great at bluffing and her and Charming get back on course through their own doings. This just goes to show that some things are meant to happen one way or another. One thing you’re probably wondering is HOW could Hook punch himself in the face and it not have consequences. For all you Doctor Who fans, that is clearly a paradox. To interact with your past self has dire consequences as it is, but physically interacting with them would throw the timeline into chaos. So how could Hook do it? My usual explanation for moments such as these is ‘wibbly wobbly timey wimey stuff’, but this time I’m going to give a much simpler reason: He was drunk. Think about it. I’m sure sometime or another someone has punched his/herself in the face when he/she was drunk. As one of my two favorite characters, I always enjoy seeing Rumplestiltskin in his element, especially when he’s throwing hand gestures left and right. Seeing his hatred for Hook while Hook has moved past his hatred of Rumple also cast Hook in a very charming light and offered up a base-line for how much the characters of Hook and Rumple have changed from their past selves. Added humor was found when Rumple overheard he “falls for the help” as well as after he takes the memory potion and forgets everything that just happened – and why he’s in his vault. Though beyond the humor and ‘Return to Rumple Greatness’ that only Robert Carlyle can bring to the role, the best part of seeing old Rumple was seeing the hope in his eyes when he learned he would see his son – as well as the heartbreak when he learned he would find him only to lose him. Emma’s words about Neal break through Rumple’s notions that he can change things and he learns to accept what happens. We’ll see this again later one when Snow and Charming announce the name of their son as Prince Neal. 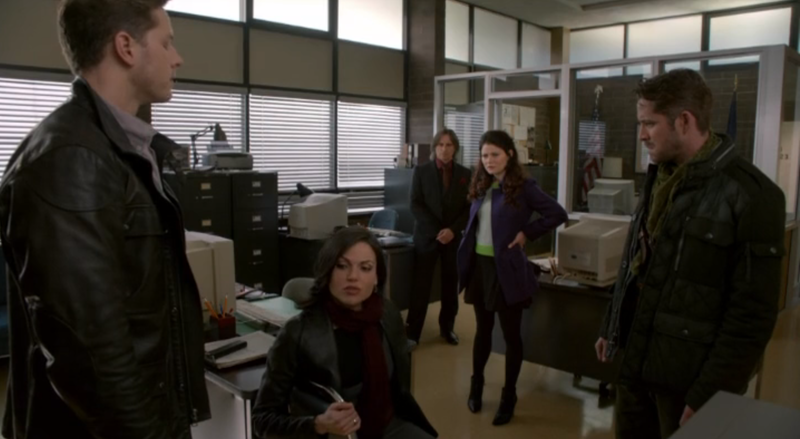 The look on Rumple’s face is so complex. There is still overwhelming sadness at the loss of his son, but also acceptance and gratitude. He knows he must move on and is thankful for Charming and Snow honoring his son in this way. I have never been more pleased at the resurrection of a character than Rumplestiltskin /Mr. Gold. Robert Carlyle is an amazing actor and has turned this seemingly dark character into one charming, deep and charismatic character who has a good heart beneath his scaly exterior. Bravo dearie, bravo. Another unexpected bright side of these time travel episodes was that we got a chance to remember Season 1 and see just how similar Emma and Hook are with Snow and Charming. Earlier in the episode we heard Charming joke – and then bite his tongue – about how Emma is so much like her mother. This idea is then reinforced later when we see Emma ruin Regina’s love life out of trying to be a good person – similar to how Snow ruined Regina’s love life years earlier. 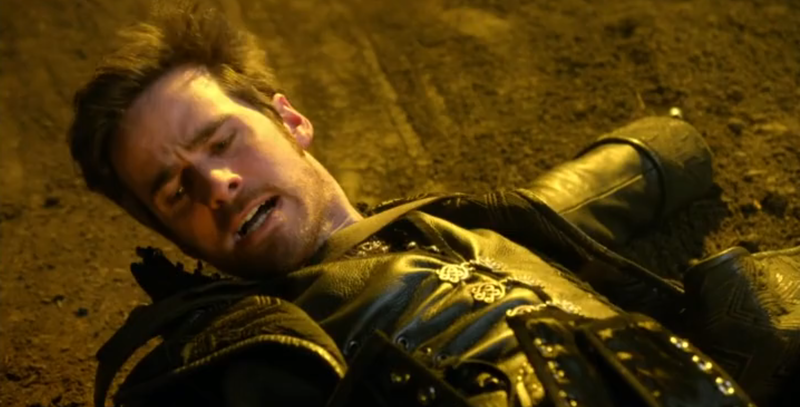 We’ve heard how Emma is like Snow, but this episode actually showed us how similar Hook and Charming are. When Hook and Charming are sitting by the fire and discussing love, we see their ideals are actually quite similar. In addition to this, we’ve seen Hook do the very thing Charming always told Snow White, ‘find her’. Whether separated by a curse or jumping into a time vortex, Hook always chased Emma no matter what. Thankfully this all worked out in the end. As we learned in the flashbacks, Emma never felt like she belonged anywhere and adopted the philosophy that home is the place you miss – and as the old saying goes, ‘you don’t know what you have until its gone.’ When she saw Snow White ‘die’ in front of her, that was the final straw Emma needed to realize where she belonged. It was her call to stop running and accept who she is as well as who she belongs with. In the past we saw some sweet Emma and Hook moments, but nothing like this episode. From their waltz to Hook punching himself to defend Emma’s honor, we see a lot of romantic moments between these two. It is only after Emma accepted that Storybrooke is her home – and putting Neal behind her with her tearful farewell with past Rumple – that she becomes open to love again and realizes what’s right in front of her – literally. We knew Hook was quiet about his missing year and how he returned to this realm. We thought the Ariel story had explained it all, but there was one part that outdid all the rest; and it was the part he wanted to keep from Emma until it was the right time to tell her. In order to return to this realm, Hook abandoned his crew to outrun the new curse and then sold his beloved ship so he could procure a magic bean that could bring him back to Emma. Emma is no longer the girl running from her past and happiness. She has accepted everything and now has a heart of a true believer – with tremendous light powers to boot. Though Emma isn’t the only one who’s arrived at a happy ending. Like a child trying to hide his mess, Rumplestiltskin alters the video footage of the jail to make it seem as though Zelena had just enough magic left to kill herself, but there is one thing he can’t hide from: guilt – especially when that guilt comes from his new wife. Belle: Rumple, this thing we have has never been easy. I’ve lost you so many times, I’ve lost you to darkness to weakness and finally to death. But now I realize, I realizes that I have not spent my life losing you, I’ve spent my life finding you. Rumple: Belle, when we met I wasn’t just unloved and unloving. I was an enemy of love. Love had only brought me pain, the walls were up but you brought them down, you brought me home, you brought light into my life and chased away all the darkness. And I vow to you, I will never forget the distance between who I was and what I am. I owe more to you than I could ever say. How you can see the man behind the monster, I will never know. Belle: That monster’s gone, and the man beneath him may be flawed, but we all are. And I love you for it. Sometimes the best book has the dustiest jacket and the best teacup is chipped. From comparing Rumple to a dusty book (the things Belle loves most) to calling herself a chipped teacup (the thing that began to embody Belle in Rumple’s mind), this speech perfectly called to mind their Season 1 flashbacks and give the perfect ending to their tale. Could the reveal that Rumple killed Zelena be bad news for his and Belle’s marriage? Possibly, but remember this. Rumple spent decades trying to move heaven and earth to find his son, just to lose him in a trick by the Wicked Witch. A trick that didn’t only kill his son, but also resulted in Rumple hurting the people he’s come to find joy with. Did he lie and deceive Belle? Yes, but not because he’s a trickster and meant her harm. He deceived her because he had no other choice and simply could live with the grief this woman had put him through. Not to revive the comparisons, but in the sequel to Back To The Future, Marty takes something ‘out of time’ and brings it back to his time, which horribly alters the future. From the moment we meet this woman whom Emma wants to save, we know something is bad about her. We know that something about her presence will ruin someone’s present. Whether you realized she was Robin Hood’s wife at the end or when she first appeared like I did, bringing Marian back to their time was an awful idea that’ll have horrible consequences for Regina. Marian’s presence effectively ruins her happy ending with Robin in many ways. For starters, she’s Robin Hood’s wife. We also learned in this episode that Regina’s execution order was the thing that was supposed to kill her. Despite all these awkward situations and revelations to come, I don’t think Regina will go back to being evil. She has come so far this season and to undo that would be awful for the show. Also note how when Regina accused Emma of being as bad as her mother, she didn’t say “I’ll destroy you’ or anything of the sort. She simply warns Emma that she hopes Emma didn’t bring anything else with her. Regina’s learned from her past and saw in Zelena how filling yourself with vengeance only hurts you in the end. Regina’s love life might be up in ruins right now, but I’m sure she’ll stay on the side of good. Early in the episode, Belle mentioned Rumple’s dark vault in the Enchanted Forest, a place where he kept the most dangerous magic that even he didn’t understand. When we finally see the vault, it’s enormous. There is literally storyline after storyline of dangerous objects in this vault. Since we met Medusa earlier this season, we know Greek mythology exists somewhere out there so I was totally expecting Pandora’s Box. What we got, I didn’t expect in the slightest. Next Season – or at least first half of the season – will be based off the popular Disney movie Frozen. Adam Horowitz and Eddy Kitsis had spoken about their desire to bring some of Frozen to Once, but I personally feel like this was much too soon. Between the super close up her back and just something about the style of filming here, it just seemed too rushed and last minute added. This seemed more like a ratings grab to expand their audience for next season. To be fair, I think they can do a great job with the Frozen material, but I’m just worried about certain things. For example, if Elsa drops someone off a building and says ‘Let it go’ I might pass out from sheer disappointment. That being said, I don’t think they’d pull anything that corny. Elsa is a good character who is the product of fear. We’ve seen character stories and allegiances changed before (ie: Peter Pan), but I think Elsa has the potential to be the next Regina – a redeemed villain in the end. All and all this was a great season finale that honestly seemed more like a series finale than a season finale. With so many stories wrapped up, I’m worried an extra season might spoil these already existing happy endings – like how Regina’s was just made more complicated. With new characters set to join next season such as the Knave of Hearts from spinoff Once Upon A Time in Wonderland, it’s entirely possible that the happy endings we got in this finale will stay happy and we’ll have a new bunch of central characters to explore in Season 4. PS: Why Are You Still Alive? One last comment on this finale is something that you easily could have missed: Princess Aurora. Last time we saw her and her husband, they were turned into flying monkeys for spilling the details about Zelena’s plan. Early in these episode, Leroy mentions how Aurora was changed back into a human before she gave birth to a baby flying monkey; and then at the episodes end we see her – in Enchanted Forest garb – alone in Storybrooke. HOW? You! You there on the side in the white dress! HOW ARE YOU STILL HERE?